Synchronized, instant notification on iPhones, iPads, Android devices and laptops. Wireless sensor tags connect events in physical world, e.g. 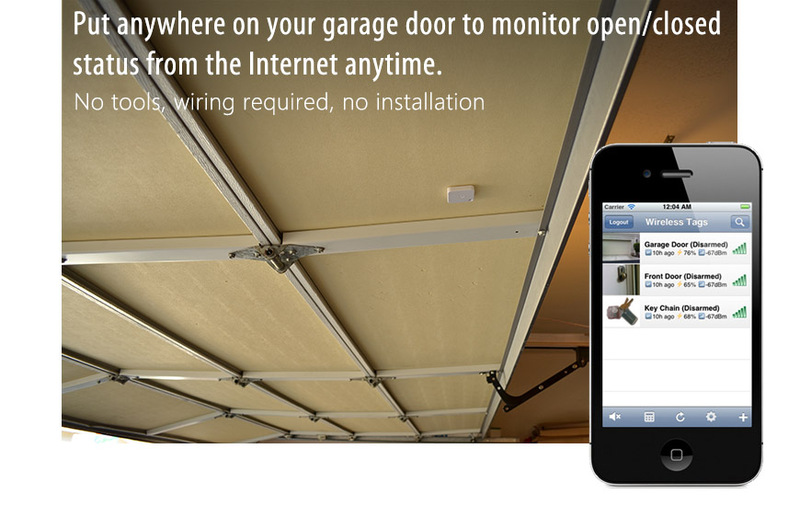 motion, door/window opened/closed, temperature or humidity exceeding limits, to your smart phones, tablets and any Web browsers anywhere in the world with Internet access. An event is instantly received on all devices (unless you configure it not send to some). through push notification, no messaging charges apply. The wireless sensor tag is a real-time, cloud based system, so any change you make from one device instantly appears on your other devices: watch what this means. KumoApp currently provides native support for WeMo switches/bulbs, Honeywell WiFi thermostats, Nest thermostats, and Dropcam integration. The WirelessTag IFTTT Channel allows you to link with over a hundred types of Internet connected products and services, although with slightly more latency than KumoApp. Other home automation systems can be integrated through Web service API or custom URL calling on event. Small, inexpensive and years of battery life. A wireless sensor tag is small, inexpensive and has up to years of battery life depending on settings and usage. See technical spec . 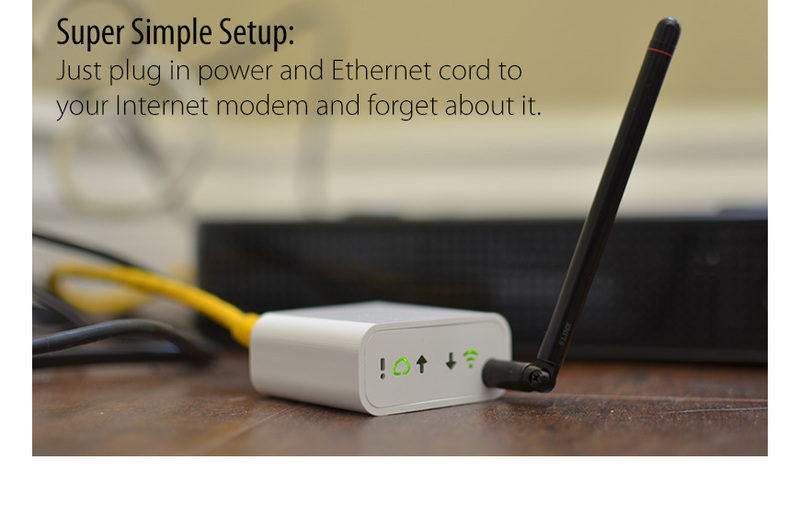 These are possible because all the power hungry tasks are performed by the Ethernet Tag Manager, which is plugged into the wall power and to your Internet connection. 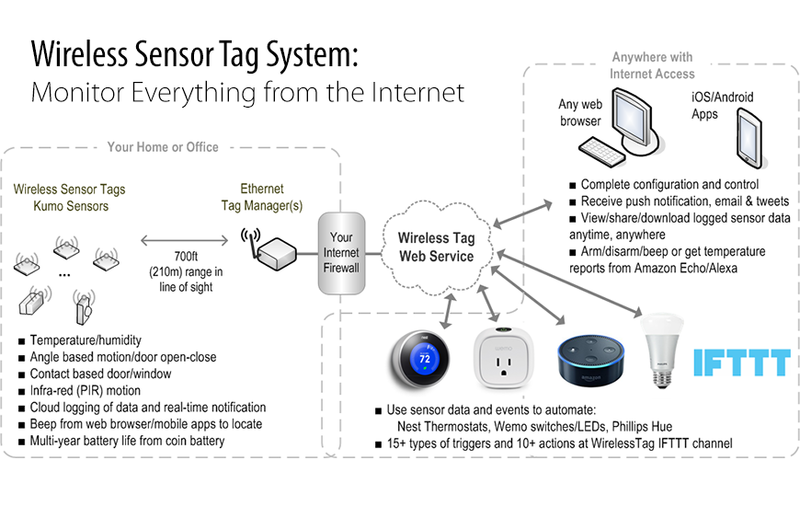 Each wireless sensor tag focuses simply on sensing the physical world and sending the information back to the Ethernet Tag Manager up to 200m (700ft) away, in the most energy efficient way possible. Maximum 40 wireless sensor tags can be associated with one Ethernet Tag Manager. See technical spec. Each wireless motion sensor tag has a 3D digital magnetic sensor that can precisely measure the orientation of the tag (referenced to the magnetic field of the Earth) with a resolution less than 1 degree. Periodic measurement detects the slightest orientation change resulting from the tag being touched/moved. Watch demo of sensitivity test . In magnetically noisy environments (such as near a moving magnet! ), the user can reduce the sensitivity up to several orders of magnitude to eliminate false alarms. Unlike other acceleration sensor based motion sensors, the sensor does not have to be always on in order to capture a disturbance at its exact moment. This patent pending technology of angle based motion sensing trades off a few seconds in notification delay for years of battery life with a tiny coin cell battery, allows each motion sensor tag to be small, light and thin. The user picks a different trade-off between response delay and battery life that best suits the application, individually for each wireless motion sensor tag. 3D magnetic sensor detects not only tilt, but also horizontal rotation. Therefore, it does not matter which direction the tag is placed with respect to the rotation or disturbance to be detected. Watch demo. When configured in "Door/gate mode", each tag may be attached to any moving surface of to garage doors or regular doors in any orientation, or simply thrown into your fridge door pocket to monitor if the door is open or closed. You can configure the Web app, Android or iOS app to speak to you when a door is opened, opened for too long, or until door is closed from the Motion Sensor Options (iOS/Web/Android). When configured in "motion detection mode", each tag may be attached to remotes, keys etc to receive notifications and access historical statistics when they were used. Temperature monitoring with battery life in mind. Wireless Sensor Tags are designed to maximize battery life. Since transmitting data over the air uses a lot more energy than reading from the internal temperature sensor, each Tag transmits only when temperature has become too high, too low or returned to normal range. To this end, each Tag has built-in algorithm with hysteresis (to prevent back-and-forth transmissions when temperature is at the boundary) to determine if one of these three events has occurred, and transmitting only then and if temperature monitoring is enabled. You can program the upper and lower temperature threshold and calibrate out temperature sensor offset from the "Temperature Sensor Options" (iOS, Web/Android). When "Auto-Ping" or "Update every..." is enabled for out-of-range notification, the tag appends the latest temperature sensor reading to the status information packet transmitted. Since the radio channel to the Tag Manager only needs to be made ready once, the additional battery drain is minimal. You can review historical temperature at each tag by tapping the "Temperature Stats" button in tag detail screen (iOS, Web/Android ). You can also download the entire captured raw data as one CSV file for custom processing. 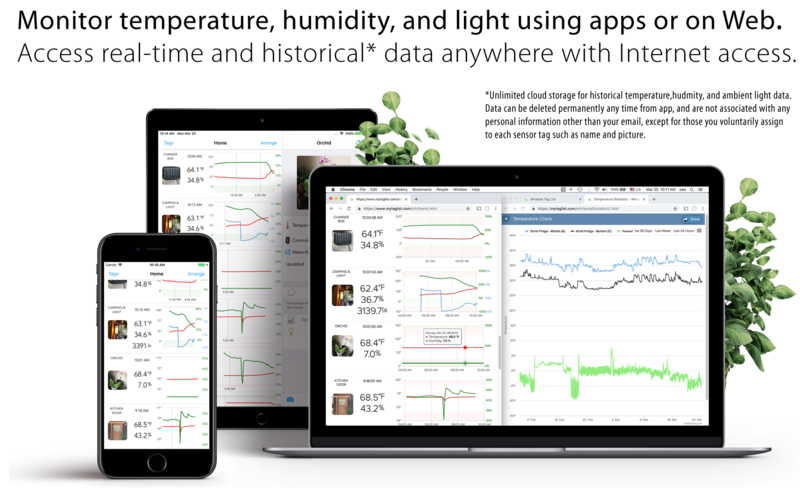 View temperature, dew point, and ambient light on your Phone from anywhere. 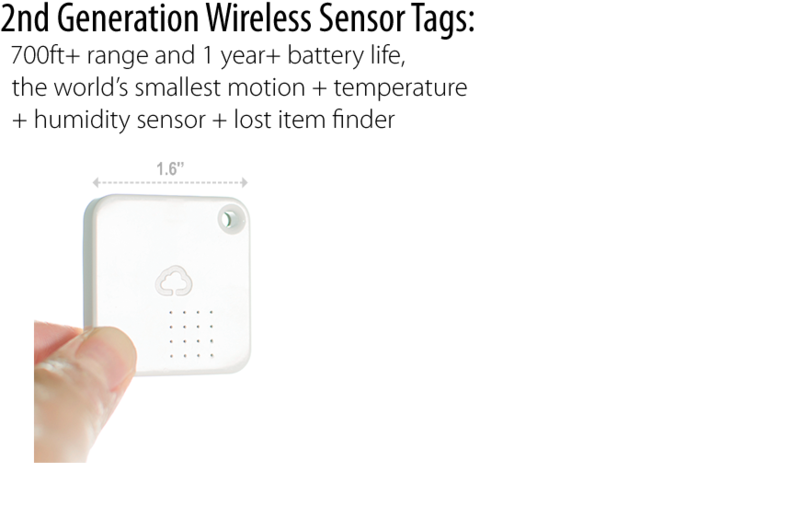 Place the tiny Wireless Tag Pro ALS (1.6'' wide) together with your indoor/balcony plants to capture exactly when and how much light reaches it, then view in real-time anywhere with Internet, anytime with unlimited cloud storage of logged data. The app automatically calculates the Daily Light Integral, an important metric that must be optimized for plant growth (Sunlight assumed, 540lx = 10µmol m-2 s-1). Automate and optimize your lighting. You can use IFTTT, KumoApps or URL calling to dim Philips Hue, LIFX or WeMo LEDs to achieve the exact level of brightness when the available natural light changes. You can also make it automatically dim room lighting when TV is turned on, for example. Detect sudden change of lighting. Wireless Tag Pro ALS notifies you on sudden change of brightness caused by picking up the tag or opening doors or windows. It will not trigger by gradual change of natural light throughout the day. Place the tag in your freezer to not only monitor temperature and humidity inside, but also get notified whenever it is opened. Since the sensor tag itself does not have to move to detect the open event, it can be placed anywhere inside the freezer. Because each wireless sensor tag is so small, anybody can easily lose one. Tap the beep button in the iOS/Android/Web app, and the tag will keep beeping until it is picked up. All you need to do is track down the beeping sound and pick up the tag, and the beeping will stop automatically. See details: iOS or, Web/Android. Attach the tag to key chains, put inside your wallet, or strap to TV remote controls, and never waste time looking for these items again. Customizable response delay and battery life. By using the Wireless Settings, you can change trade-off between battery life and range (slower data-rate results in longer range but worse battery life since it takes longer to transmit/receive), battery life and response time. For example, if it is something you only look for once a year, and want the battery to last several years, set it to "within 9 sec" response time, and "38.4kbps" data-rate, and battery life is estimated to be 85 month (about half of that when motion sensor is armed.) . Smallest PIR sensor with professional grade reliability. Measuring only 1.1'' wide, almost its entire width is occupied by the lens of super reliable and sensitive Panasonic low power PIR sensor module. Our customers tell us this sensor has better sensitivity and less false alarm than any other PIR motion sensor they have tried. 13-bit temperature and humidity sensor. PIR KumoSensor integrates high accuracy/resolution 13-bit temperature and humidity sensor, which allows you to cloud-record temperature and humidity data month after month, and get notified anywhere in the world when temperature or humidity is out of normal range. If you have a Honeywell WiFi or Nest thermostat, you can configure it track and regulate temperature at the sensor. Despite its small size, the wireless PIR KumoSensor includes the CR2450 battery which is enough to last for 3~4 years at the default settings. The industry leading low power consumption of the Panasonic PIR sensor module combined with "low power receive mode" in the radio makes the sensor draw less than 15μA average current with default setting. Contact based sensor provides immediate response at open and close. Reed KumoSensor sends you notification immediately when it is moved away from/back to a matching magnet piece. The contact sensor triggers when the two pieces are close, but they do not have to be completely in contact. This allows you to adjust the installation position to define the opening threshold. The powerful combination of immediate sensor response and the low latency of KumoApp, allows you to turn the Reed KumoSensor into a switch for WeMo light , among many other potential applications. 13-bit temperature/humidity sensor and external water proof probe connector. Reed KumoSensor not only integrates the same 13-bit temperature and humidity sensor used in other tags, but also supports connecting the most widely used, DS18B20 series water proof temperature probe for logging/notification of pool temperatures, for example. The wireless Reed KumoSensor includes the CR2450 battery which is enough to last for 3~4 years at the default settings. Resistive water detection and capacitive moisture level sensor. This tag has a resistive sensor at its tip to detect water presence, and capacitive sensors across the exposed portion of the circuit board to measure dielectric constant of the surrounding soil or liquid (for water level). The moisture level is derived from measured capacitance after a two point calibration by user to define, what kind of condition is "0%" and what is "100%". The resistive water detector is immediate, while the moisture level measurement is taken and compared against adjustable thresholds at a user configured interval. Longer battery life, water proof. By removing the piezo buzzer from the tag, we made room for a CR2450 battery which has 3x capacity than the battery used in our regular motion sensor tags. The circuit board, together with the battery have a water-proof coating. The battery will last for typically 3 to 4 years is not replaceable. Get notified when each tag goes out of range and returns back in range. By setting "Auto-Ping" or "Update every...", each Tag is configured to transmit a status information back to the Tag Manager at a certain interval. Upon receiving such status information, Tag Manager transmits an acknowledgement response back to each Tag. When the Tag does not receive the acknowledgement, it repeats the status information transmission for many times before giving up and enter a hibernate mode. The system only decides that the tag is missing and send out notifications when it does not receive the status information by the estimated time plus the time needed for the retransmissions. Therefore, even when because of temporary interruption a single transmission is not successful, very reliably the system can detect if a Tag has gone out of range or gone missing. See how to receive out-of-range notification: iOS or, Web/Android.